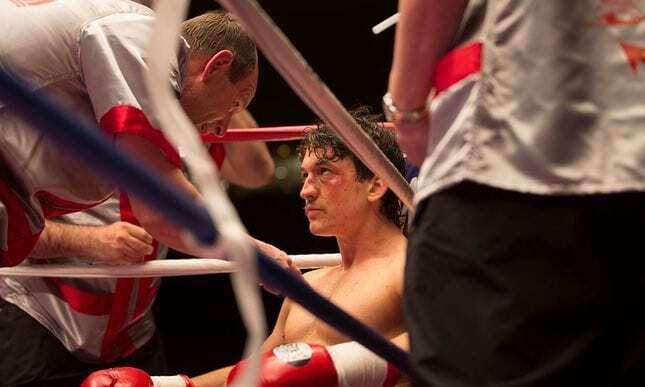 Miles Teller puts in a robust performance in Bleed For This as Vinny Pazienza, a working class boxing hero from Rhode Island, who against all odds manages to overcome personal tragedy to make it all the way to the top. Written and directed by Ben Younger, the film tells the real-life story behind the headlines of the man nicknamed “the Pazmanian Devil,” for his less than orthodox behaviour in and out of the ring. The film charts Pazienza’s struggle to get back in the ring after breaking his neck in a near-fatal car crash, and charts his struggle to convince everyone around him that he still has more to give. Teller carries the movie from the start, but unlike his career-defining performance in Damien Chazelle‘s Whiplash (2014), he is unfortunately given very little to work with here. As boxing biopics go, Bleed For This is pretty formulaic. Its cliché ridden narrative lets the story down from the outset, its characters do what is expected of them and the film seldom seems to veer off the predictable narrative arc. It is also only fair to mention how little effort was put into developing its female characters. Make no mistake, this is not a film that would easily pass the Bechtel test, nor should it be expected to. It is however disappointing to see how unremarkable its female characters are. Katey Sagal as Vinny’s mother does her best as the overprotective catholic mother, but is sadly let down by a hackneyed script and a predictable narrative. It is also worth mentioning Ciarán Hinds who is terribly miscast as Angelo, Vinny’s father. Hinds seems unable to commit to just one accent or delivery style throughout the film. Despite an excellent performance by an almost unrecognisable Aaron Eckhart as Kevin Rooney, Vinny’s washed up alcoholic trainer, Younger’s characters simply fail to convince. The big loud Italian-American family act soon starts to wear thin and all we’re left with is a mishmash of Scorsese pastiches with people trying to outshout each other. The film’s lack of nuance and its constant reliance on replicating better boxing biopics instead of bringing something new to the genre is perhaps where Younger falls short of convincing his audience. Bleed For This misses mainly because it relies too much on second-guessing what its audience wants from it, but the film is at its best when it isn’t trying too hard to be other films. For instance, the fight scenes are beautifully shot and performed. Teller looks and convincingly acts like a boxer in the ring – his physical transformation into Pazienza is remarkable. On the whole, Bleed For This may not qualify as the most original film of the year, but it is an enjoyable watch providing you are willing to ignore its shortcomings. Bleed For This is in cinemas from December 2nd. Next PostWesterns That Aren’t Westerns or are they?